Foundation’s hot right now and I swear by it. Having used both Bootstrap and Foundation, I quickly decided that Foundation was the framework for me and I use it for everything. It’s really clean, easy to work with and I don’t have to fight with it to get what I want. I do a lot of work with WordPress so I spent a good bit of time trying out all of the high profile WordPress themes built on Foundation. They all had their pros and cons – that’s a post I’m not going to write – but Reverie stood out to me as the clear leader. It’s well written, clean and simple but not too simple; It’s actually OK as a good looking out-of-the-box theme but it’s not bogged down with a bunch of dumb options. It’s also well maintained and kept pretty close to the current version of Foundation. I’ve used Reverie on this site and the Little Bahalia Publishing site. Reverie is set up to use Compass, which is great; Compass is really powerful and it does a lot of neat stuff if you’re using SASS. I’m all about Compass but lately I’ve been leaning more towards Grunt. I’ve been hearing about Grunt for a while but I was only formally introduced to it recently by Nathanael Smith who did a talk on it at a couple of memtech user groups. If you aren’t familiar with Grunt, Check out the getting started page to learn more. 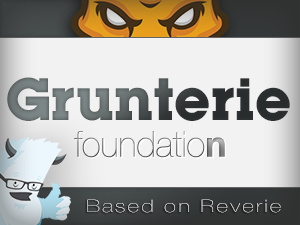 Turns out Grunt’s pretty awesome and the official Foundation install docs recommend it. So, long story short, I Gruntified Reverie. I started out with a new Foundation project that I created with the Foundation gem, added the reverie theme files, tweaked some stuff to make it work nice and called it Grunterie. It’s got all the cool templates and features from Reverie with all of the advantages of Grunt. And since it was built with the foundation gem, you can update foundation with $foundation update and stay on the cutting edge. No more waiting around for the latest version. I still vote for Reverie as the best Foundation WordPress theme if you want to use Compass but, if you want to use Grunt, check out Grunterie.